Layer 2 on the bottom of the board I&#039;m thinking some bitcoin spreading from the tail toward the middle and fading out the brighter colours should reflect onto the snow. Then a white strip down the right hand side of the board should be like this brown strip on this board but thinner then have my Company name Coin Capital Ventures written in the white strip down the side in black with the logo after it. That is pretty well all I want on the board but if you think of something cool and it flows and goes with that realistic sharp kinda look I&#039;m going for you are welcome to show me what you are thinking. Maybe throw the FYVE brand somewhere on the top also where it fits in white. The board templates can be downloaded of the Fyve website [login to view URL] also make sure your artwork is high enough resolution/quality for print. We reccomend that all artworks are at least 300dpi, and converted to CMYK. Vector files are also highly reccomended if possible. can i try again? i got a day time for this.. can you provide some feedback on that? Sorry, Can't get what you want as a base layer first image ? 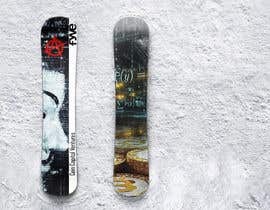 >>>> Bottom of the board base layer on the whole board the "first image"
There are no attachments. What is the first image? and the logo of your company? In addition to the inconvenience of not being able to download the templates from the web page.